West Lancashire Provincial Grand Master Tony Harrison presented £5,000 to Lifelites, the Freemasons’ funded charity that provides state-of-the-art life-changing assistance technology to children’s hospices. The presentation was made to the CEO of the charity, when she visited Blackpool recently during a nationwide fund raising initiative. Some of the incredible technology provided to hospices by Lifelites. Through the magic of technology, Lifelites gives severely disabled or life-limited children opportunities they wouldn’t otherwise have. Many of the children who benefit from the Lifelites technology suffer from very limited movement and are often unable to manipulate and control anything for themselves, leading to limited communication with others and a sense of isolation. 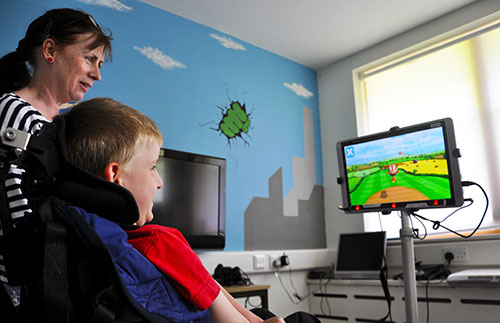 The Lifelites technology provides specialist entertainment and educational packages for these young people to learn, play, be creative and overcome some of those restrictions, helping them to interact with friends and carers, encourage social development and relieve isolation, as well as providing an opportunity to have fun and enjoy life – for as long as it is possible. Tony Harrison and his wife Maureen with the certificate of recognition from Lifelites. It also gives children in hospices the opportunity to do so many things that they never thought possible, such as play a game, paint a picture, create music, or communicate with their family. 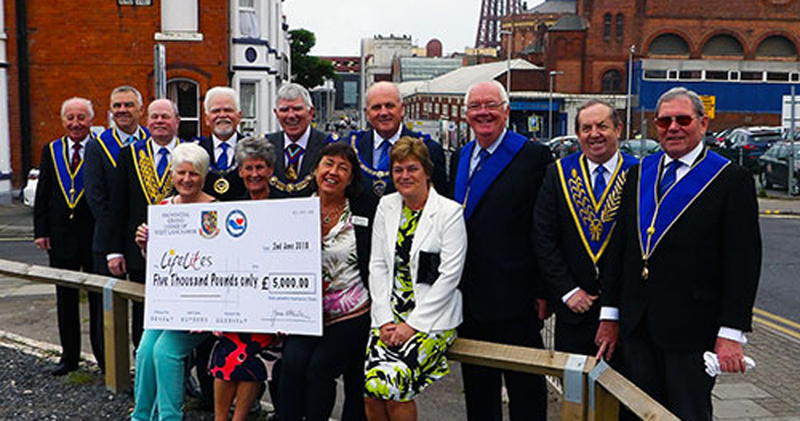 Under the backdrop of the iconic Blackpool Tower, Chief Executive of Lifelites Simone Enefer-Doy was on hand to receive the West Lancashire Freemasons’ Charity donation from the Provincial Grand Master and other eminent West Lancashire Freemasons and their partners. 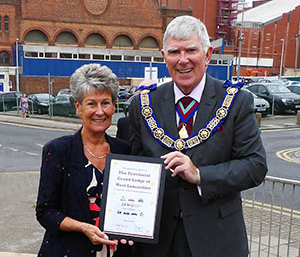 In return, Simone presented Tony with a certificate in recognition of the West Lancashire Freemasons’ Charity’s continued and much valued support of Lifelites. Simone’s visit was part of a ‘national fundraising initiative’ entitled ‘Lifts for Lifelites’, which saw her visiting a number of famous landmarks across the 47 Provinces within England, Wales and the Channel Islands. In many instances she was conveyed between adjoining Provinces by unusual or ‘classic’ modes of transport. The trip resulted in £103,000 (latest total at the time of writing) being raised from Provincial donations, to aid the work of the charity. More information regarding Simone’s journey can be found by following this link. Tony Harrison (standing centre) presenting the award Simone Enefer-Doy (seated third from left).